It's been a long while since I last had spätzle, and I was reminded about it while watching an old episode of The Hairy Bikers. Spätzle is a pasta dish, often served up with a casserole. Any meat in sauce works with though, so steak in peppercorn sauce would also work. It is a European cuisine found most often in areas of Germany, Austria, France etc. It's pronounced spetz-lee by the way, it's bizarre watching cookery shows say it incorrectly but they got it wrong on an episode of Master Chef too a while back, so The Hairy Bikers are in good company there. Anyway despite watching the expertise of the Hairy Bikers making it, and my grandma before them, I wondered if anywhere actually sold the stuff ready to cook. To my amazement Ocado had bags available, so I put through an online order. 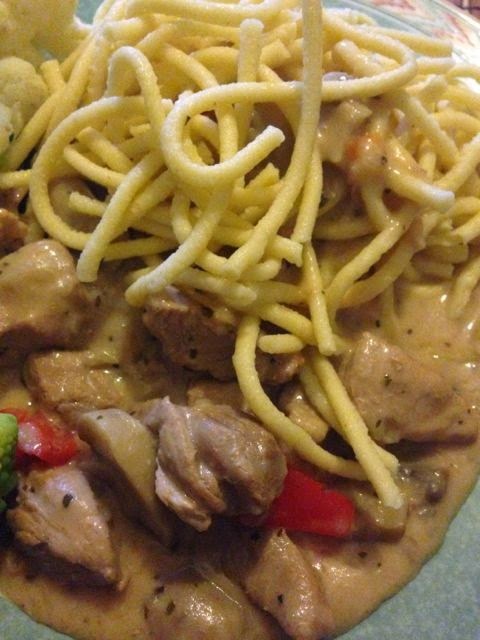 We chose to have it with a pork casserole, with a creamy sauce. The bag from Ocado is imported from France, and pieces are bigger than I thought they would be. I remember the bits being 2-3cm these look more around the 10cm mark. 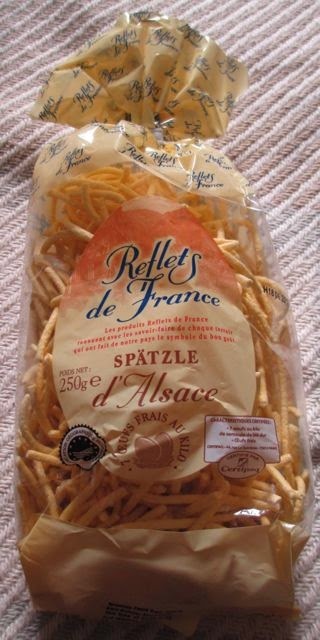 I wonder if that is a regional thing, it is the German spätzle I remember. They take 15mins in boiling water too cook, and are best served al dente. Although quite large the pieces have a wonderful texture, and were quickly coated in the creamy sauce from the casserole. They worked really well with it, and brought back a lot of memories for me. It was great for absorbing the sauce and a good alternative accompaniment for a sauce meal.